You may think you know about South Padre, the barrier island in southern Texas renowned for its Spring Break parties and summertime family vacations. But a visit to the South Padre Island Birding and Nature Center is virtually guaranteed to change your perspective, not to mention your state of mind. The ecotourism attraction is one of nine in Texas established by the World Birding Center, which was created by Texas Parks & Wildlife and U.S. Fish & Wildlife Services to showcase the entire Rio Grande Valley as a world-class birdwatching destination. With 10,000 acres stretching across 120 miles of river, from South Padre Island west to Roma, these diverse protected habitats provide essential sanctuary for birds and myriad other wildlife. South Padre Island’s coastal wetlands are a crucial first landfall, offering a safe haven for migratory species making their way north from Central and South America. 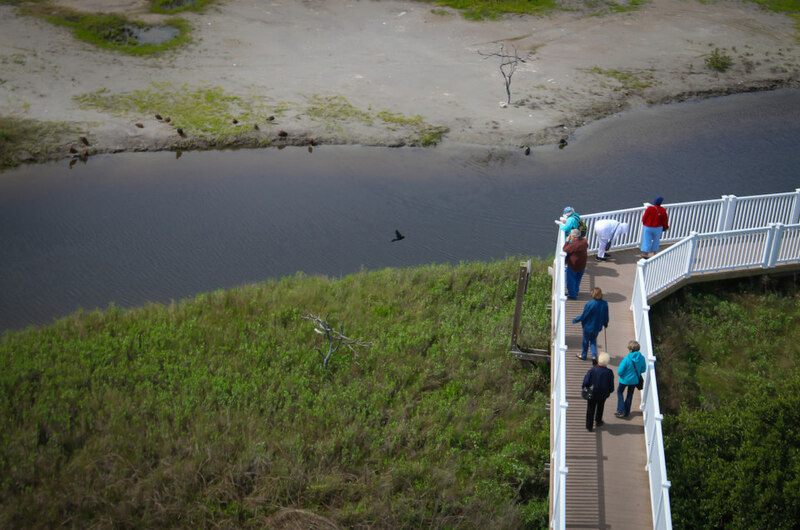 Located near the southern tip of the world’s longest barrier island, the Birding and Nature Center is an impressive conservation effort, allowing our avian friends to recover from their long journeys. The facility is situated on a slender stretch of land dividing the shallow waters of the Laguna Madre from the rolling waves of the Gulf of Mexico. But its 50 acres provide a diverse array of habitats and biodiversity. Dune meadows, salt marsh and intertidal flats are dotted with thick grasses, native shrubs and trees that provide safe nesting grounds, as well as plentiful food sources for native and migrating birds alike. Tucked back from the main highway far from the island’s commercial center, the South Padre Island Birding & Nature Center feels far removed from other tourist attractions. 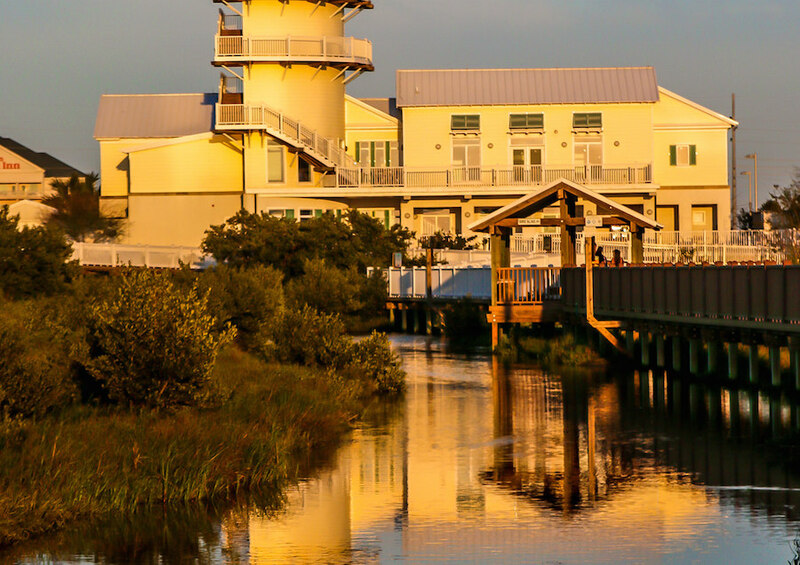 The vivid yellow Visitor Center, with its 5-story tall Birding Tower, welcomes you with its lushly landscaped butterfly garden, man-made waterfalls and– during our visit– a turtle keeping a watchful eye over the entrance. Once inside, you’re given a one-page site map and wildlife scavenger hunt, featuring 15 species that can be found on the grounds year-round. First-time visitors will want start by watching the brief but informative introductory film on the island’s role in migratory bird conservation, which explains the Center’s ecological importance in greater detail. It’s also worth checking out the hands-on educational exhibits upstairs, which help give guests a greater understanding of what they’ll see once they head out the back door to explore the center’s 3,300 linear feet of boardwalk nature trails. We don’t have to venture far to find a glimpse of our fine-feathered friends. Statuesque Great Blue Herons and various Ducks wade in the shallow pond right off the deck. Red Wing Blackbirds and a Ringed Kingfisher sit atop the railing, with the former chattering noisily as the latter hunts for a quick bite to eat. Huge flocks of White Ibis and Brown Pelicans soar directly overhead, crossing from the bay side to the gulf. But taking a long, slow walk around the Birding & Nature Center grounds reveals other species that aren’t quite so easily spotted. A Long Billed Curlew uses its curved bill to peck tiny morsels found in the saltwater tidal flats. 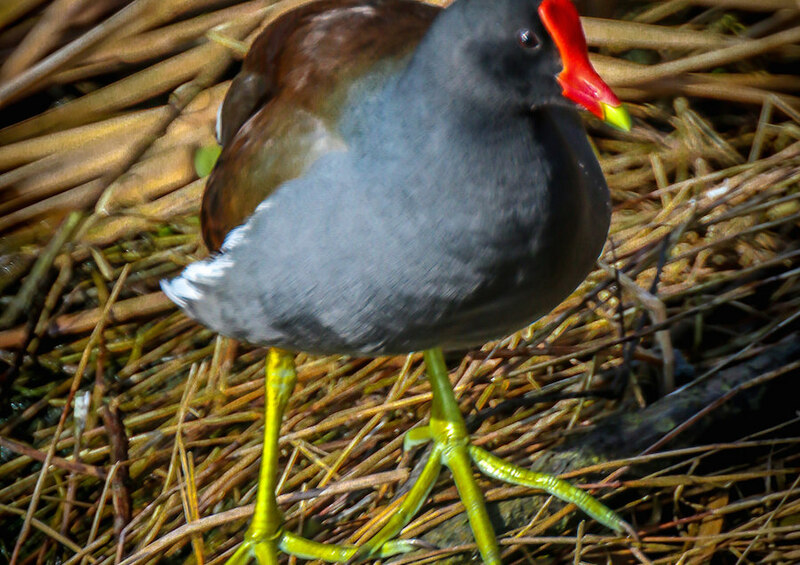 The Common Gallinule, which looks like a cross between a chicken and a duck with its distinctive red and yellow beak and HUGE matching feet, can often be heard before it is seen, squawking while hiding nervously in the reeds. 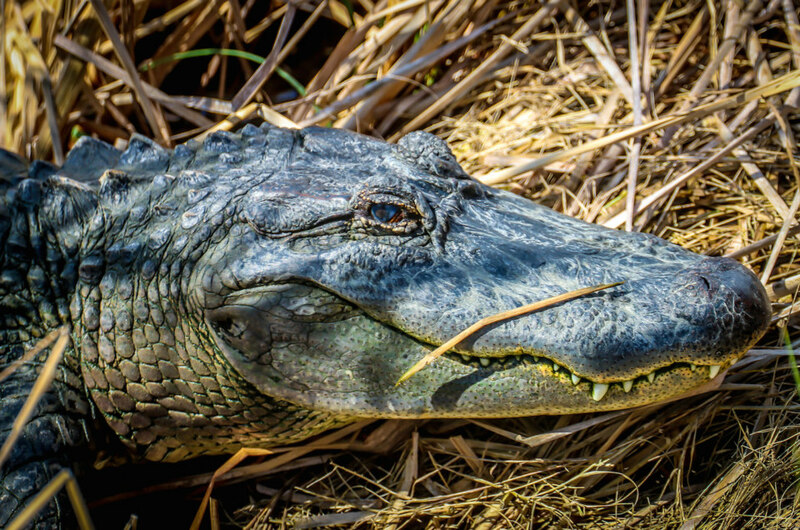 An American Alligator gradually emerges from the depths of a freshwater pond to sun herself on the banks. Sometimes just sitting quietly in the shadows of one of their five bird blinds provides opportunities to see and photograph a wide range of wildlife from a surprisingly close distance. Blind #3, overlooking the lovely Laguna Madre Bay, afforded glimpses of Cormorants, Skimmers, Brown Boobies and Little Blue Herons grabbing their morning meal. At Blind #4, situated in the center of a freshwater inlet surrounded by dense cattail marshes, we saw Redfish, a trio of Turtles, hunting Osprey and several migratory species we couldn’t identify. 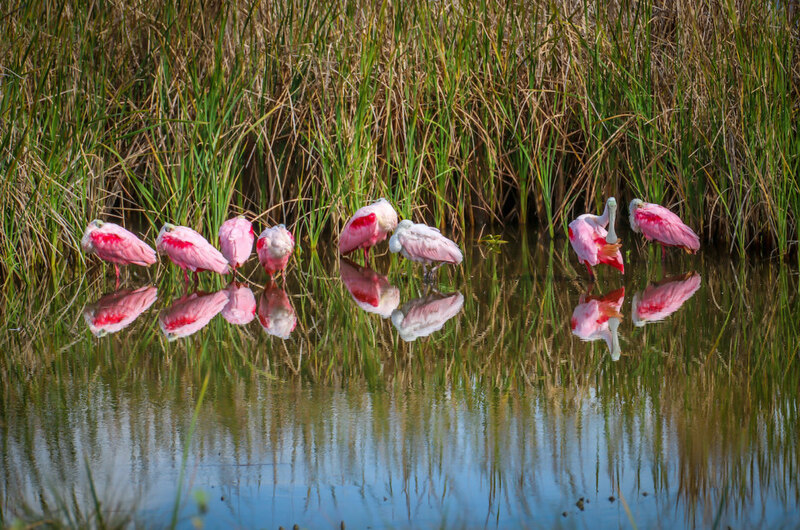 But my favorite sighting of the day was a flock of 8-10 Roseate Spoonbills we found resting nearby. Although we’ve seen these beautiful birds (which are distinguished by their brilliant pink color and spoon-shaped bills that allow them to sift through mud for crustaceans, aquatic insects, frogs and newts) elsewhere, we’ve never gotten so close as we did in South Padre Island. Along with autumn, springtime is a great time for visiting the South Padre Island Birding & Nature Center, particularly the window between Spring Break and the start of summer vacation season. Not only because the crowds are a bit smaller, but also because this is when many migratory birds make their way along the Central Flyway route. Around 380 avian species have been spotted in the area, which is home to significant portions of North America’s Least Tern, Piping Plover, Reddish Egret and Peregrine Falcon populations. As the spring weather turns warmer, you can also find many of Latin America’s most beautiful birds here as tropical species such as Buff-bellied Hummingbirds, Green Jays and Green Parakeets make their way north of the border. If you have a chance, try to visit at least twice: In the morning, there’s lots of feeding activity as the sunlight warms the coastal waters. But nighttime provides stunning sunset views, both of colors dancing upon the waters and of the Center reflected in the tidal flats. It’s a spectacular way to wind down a day at South Padre Island’s most impressive ecotourism attraction.